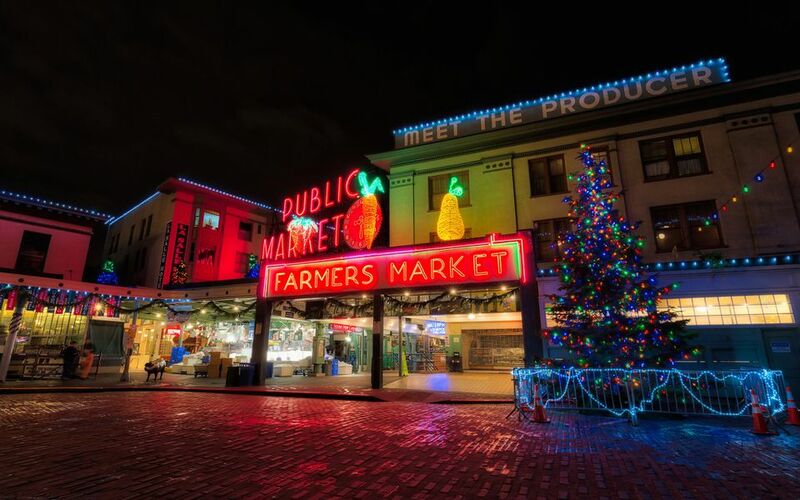 In the far northwestern corner of the United States, the Puget Sound Region of Seattle and Tacoma, Washington, plays host to a variety of Christmas events and attractions each year. Whether you enjoy the arts, shopping, or outdoor adventures, you'll find plenty of ways to celebrate the winter holiday season. While the city of Seattle offers its own series of festive activities, you won't want to miss other local events across the Puget Sound. From Christmas light shows and concerts to festivals and ice skating at local parks, there's plenty to do this holiday season in Washington state. For comprehensive listings of holiday events in and around the Puget Sound region, check out The Seattle Weekly holiday calendar and the Seattle Times entertainment calendar during the months of November and December. Colorful twinkling displays of lights, whether decorating a house or an entire zoo, create that special festive atmosphere that lets people know the holiday season is here. Whether you take in holiday lights shows on a driving tour or on an outdoor stroll, there are numerous opportunities in and around the Seattle region this holiday season to see dazzling lights. One of the most popular and unique shows in the region is the Christmas Ship Festival, which sees the Argosy Christmas Ships bedecked with lights in holiday parades on Lake Washington, Lake Union, and the Puget Sound on various dates throughout the month of December. Each holiday season brings a number of traditional favorites to Seattle entertainment venues, including Pacific Northwest Ballet (PNB) annual production of "​The Nutcracker" and the A Contemporary Theater (ACT) Theatre's traditional performances of " A Christmas Carol." From religious pageants to comedic plays, there are plenty of special seasonal concerts and performances coming to the region in November and December this year. Be sure to check out the Tacoma City Ballet, the Puget Sound Revels, and the Northwest Boychoir for additional holiday performances coming to Seattle and Tacoma this holiday season. While Christmas shopping may seem like a daunting task, the winter season in the Puget Sounds brings lots of opportunities to take care of your gift-giving needs. Whether you're looking for the perfect gift, trying to find unique decorations for your home, or stocking up for a special holiday feast, the stores in downtown Seattle and shopping malls in Tacoma area are great for discovering unique gifts this time of year. Major gift shows like the Victorian Country Christmas and the Tacoma Holiday Food and Gift Festival are also popular ways to spend the day shopping and enjoying entertaining activities in celebration of the holiday season. If you're looking for hand-crafted items, these holiday festivals are the best destinations in the region this holiday season. Originally built for the 1962 World's Fair, the Seattle Center is an art, education, tourism, and entertainment hub in Seattle near the Space Needle that hosts a month-long festival known as Winterfest each year. Winterfest will take place from November 25, 2018, through January 6, 2019, at the Armory Main Level, Fisher Pavilion, and the International Fountain inside the Seattle Center's 74-acre park. This month-long festival offers fun for the whole family, including free concerts, dances, an Outdoor Classic Carousel, the Winter Train, and the winter ice rink. Children and train aficionados will enjoy the vintage Winter Train as it winds its way through an enchanting miniature village. You'll also be able to enjoy weekly Saturday bonfire sing-alongs and ice carvings. Winterfest also commemorates traditional holidays with Kwanzaa, Winter Solstice, and Interfaith celebrations. The Puget Sound is thick with evergreen forests, but you're not allowed to just go cutting down trees on anyone's property—even during the holiday season. Instead, you can head to a local tree farm in the Seattle and Tacoma region, many of which feature special holiday events and attractions in addition to cut-your-own tree adventures. The Pacific Northwest Christmas Tree Association offers a comprehensive guide to getting your own Christmas tree and taking proper care of it in the home to avoid fires or a wilted holiday tree. Overlooking Elliott Bay in Seattle, Washington, the Pike Place Market is a public marketplace that originally opened in 1907. Each November and December, this continually-operating farmers' market celebrates the holiday season with the "Magic in the Market" event series, which includes the official Christmas tree lighting ceremony and numerous nights of caroling and concerts. Nearby you'll find favorite attractions like the Seattle Aquarium and the Art Museum, which also will feature special holiday events throughout the season. For an extra special treat, though, you should head over to the Pike Market Senior Center for the annual Great Figgy Pudding Street Corner Caroling Competition.